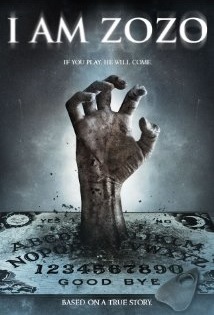 The 2014 film Ouija spelled out “BOX OFFICE HIT” on the board, as the film took in a whopping 100 + million bucks. Ouija: Origin of Evil nearly did the same. I Am Zozo (2014) predates Ouija by two years, but of course, doesn’t have the Blumhouse backing. Shot very capably on Super 8*, the film features a group of collegians off to a cottage for some Halloween fun and frolic. This abode is located on an island, and their Styx-like crossing adds some heavy Gothic ambiance. I Am Zozo, to its credit, spends ample time investing in its principals. Then there’s Nick, a budding amateur magician who dresses like one. He channels (among other things) self-styled skeptic James Randi. Mel is a pretentious Wiccan, that silly fad religion with no cohesive intellectual tradition, but a terrific character to have for a movie of this type. Naturally, she explains the finer points of Samhain to a credulous Tess and breaks out a Ouija board. Nick enlightens the two girls about the finer points of “idiomotor action,” in which people make movements unconsciously, i.e., that Ouija boards are basically nonsense. This, as they prepare for the night’s repast, a freshly caught fish, gutted in a rather pointless and lengthy montage. As the kids get increasingly drunk, they naturally conjure up spirits, one of whom, Zozo, tells them exactly what time they’re going to die. Kelly McLaren is terrific as Tess, and these kids are pretty darn likeable. There’s also some authentic dialogue (“Do you have a gun in the house? You kidding, my dad’s a liberal!”) and solid atmosphere for a smidgen budget. But we have to admit, we’re not the target audience for this by virtue of its tameness and our aversion to the mystical (we like our supernatural horror Italian – with vivid gore). As liminal horror for the newbie set, I Am Zozo is a perfectly functional and well-made psychological thriller, a film which will hopefully turn them on to more intense experiences.